There have been more than 32.5 million abortions in the twenty one years since the U.S. Supreme Court legalized unrestricted abortion on January 22, 1973. Except when noted, these statistics are based on research published by the Alan Guttmacher Institute, special research affiliate of Planned Parenthood Federation of America--the nation's largest provider and promoter of abortion. AGI has not published detailed figures on the total number of abortions since 1992, though it did give an estimate of 1,435,000 abortions for 1994 to USA Today in August of 1996. Estimates for 1993, 1995 and 1996 are based on trends from previous years. In the past, AGI has estimated a possible 3-6% rate of underreporting. The following uses the lower figure. 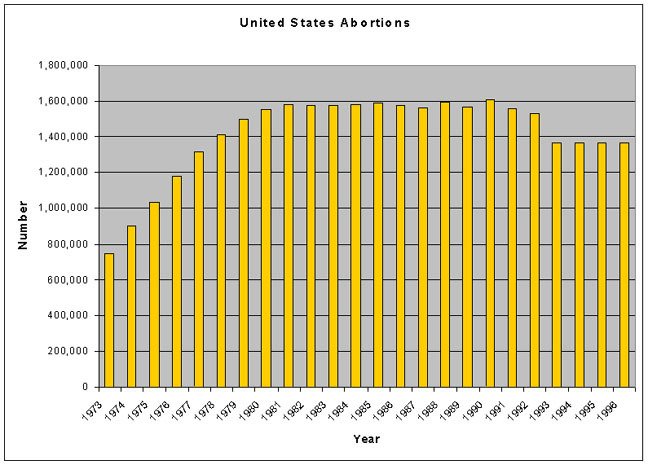 Source for statistics for 1973 through 1992: Stanley K. Henshaw, et al.,"Abortions Services in the United States, 1991 and 1992," Family Planning Perspectives, vol.26, no.3 (May/June 1994), p.101. * 1994 Statistics reported in USA Today, August 14, 1996,p. A17, attributed to the AlanGuttmacher Institute.